How Cold for New Years Eve? With little interesting weather to track, we're focusing on the overnight low temps forecast for this New Years Eve (and the overnight time period) for the MSP airport. Interestingly, all local television meteorologists were forecasting temps to be colder than virtually all national outlets. As of 6 p.m. this New Years Eve, here's the info we gathered. Twin Cities snow lovers (and haters) continued to scan the horizon for the next notable snowfall. As of this writing (Sunday afternoon), there appeared to be a chance of a little snow on Christmas Eve day and a chance for a more appreciable snow for late in the week. For forecasters challenged by last weekend's snowstorm, things don't get any easier. Mother Nature appears to be throwing another vexing riddle at the region's finest meteorological prognosticators. As of Wednesday evening, forecasters were not ready to commit to a clearcut forecast. Here are a few forecast thoughts we saw across social media Wednesday afternoon and evening. KARE11, during the evening news, mentioned that an accumulating snowfall of perhaps 2-4" is expected if the storm path continues in its current manner. 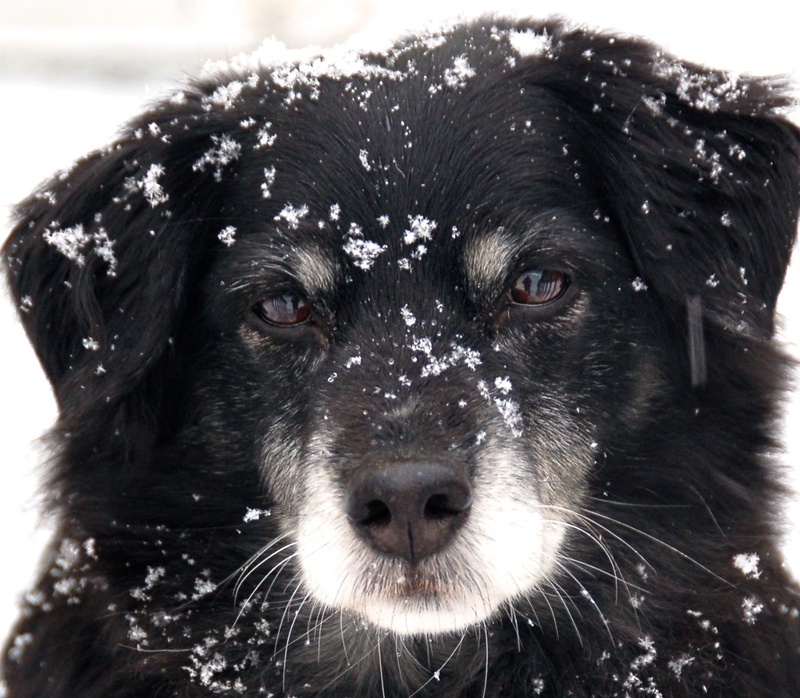 The final total for this weekend’s snowstorm was 10.5 at the official MSP airport recording station. The core metro area snowfall ranged from 9 to 14 inches with an even foot of snow a common observation, including here at TMF headquarters in St. Paul. Rather than provide forecaster grades as we have in the past, we’ll focus on a few general observations. Given that we don’t capture forecast activity in a truly systematic, day-by-day manner, we feel that the assignment of grades suggests a level of authority and exactness we simply don’t have. Still, we believe we monitor the forecasts enough to offer reasonable opinions. As always, take them for what they’re worth. We invite readers to provide grades and thoughts in the comment section to this post. The best performers for this storm were the National Weather Service (NWS) and Novak Weather. Most other forecast outlets did not distinguish themselves. Virtually all forecasters eyed this storm for the better part of a week. However, several minimized the storm as recently as Thursday. On Thursday, KMSP tweeted, “Winter returns the next few days, flurries late Fri afternoon, flurries Sat and wicked cold by Mon.” On Thursday evening, the Star Tribune noted the possibility of 1-3 inches of “oatmeal-like slush,” jokingly suggesting it would be cause to contact MnDOT and the National Guard. Likewise, the Weather Channel noted the possibility of mere “snow showers” over the weekend. At the same time, however, other forecasters were not ready to conclude the storm would be a minimal, back-page item. The NWS consistently predicted higher amounts than the majority of forecasters 36 hours prior to the storm’s arrival. Some readers/viewers may have wondered whether a winter storm warning for MSP would prove to be warranted; clearly, it was. 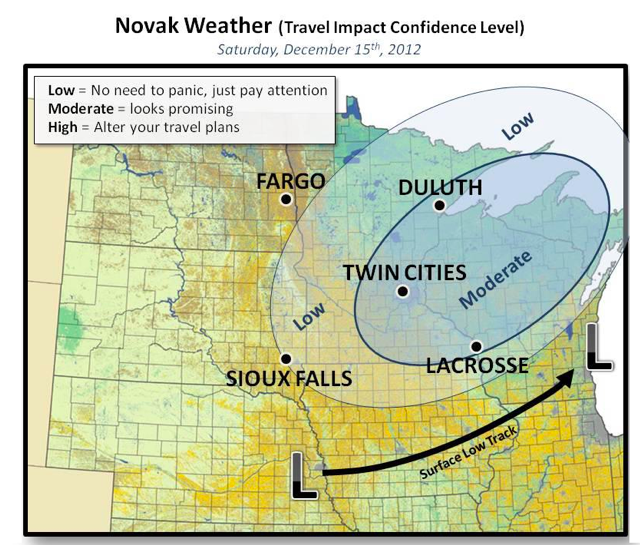 Novak Weather also lead the way on this forecast, staying the course of a forecast of 6+ inches for MSP from early on. 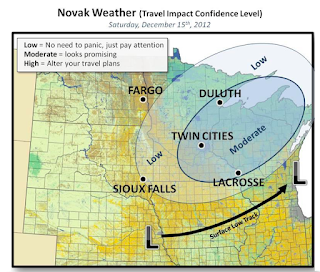 On Saturday afternoon, Novak Weather was also the first to communicate the possibility that accumulations could “get out of hand quickly for MSP” on Sunday as they ultimately did. The separation of men from boys on this forecast took place Saturday afternoon and evening. Some forecasters picked up on the late-developing possibility of a truly significant snowfall while others did not. As detailed in the previous post, forecasts by KSTP (Jonathan Yuhas) and KMSP (Steve Frazier) missed the boat in not noting the late change in the storm’s evolution (though it should be noted that other members of the KSTP forecasting team tweeted 5-8 inch forecasts at the same time Yuhas was on air forecasting 3-6 inches). It's Post Time... ehrrr Snow Time: Final Forecasts! This weekend's snowstorm appears to have a mind of its own. 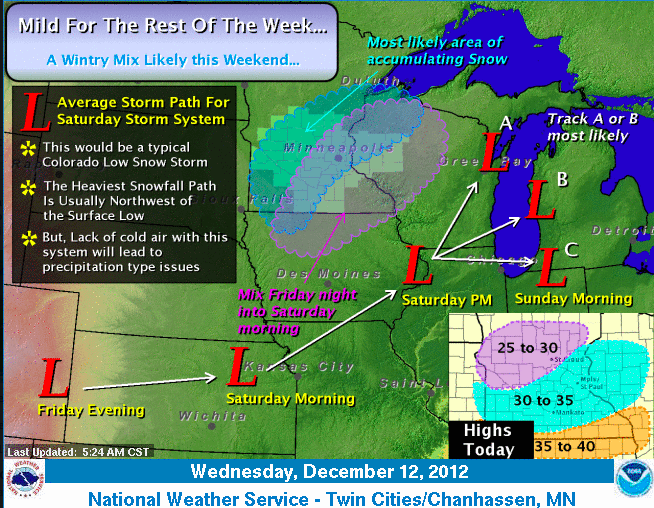 A more southerly track has caused a rapid change in most, though not all, forecasts from Minneapolis/St. 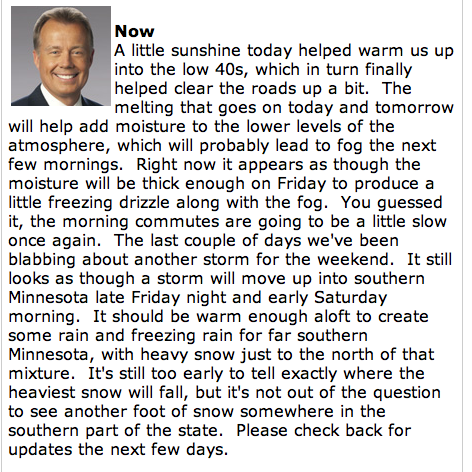 Paul weather prognosticators. 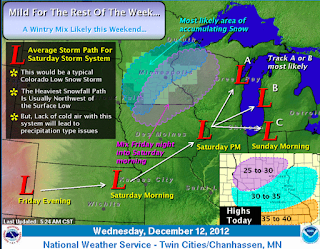 With snow on the doorstep, here was the latest thinking from Twin Cities forecasters late this Saturday evening. KSTP, KMSP and Accuweather stand out on the low side (about 4.5 inches) while WCCO, MPR and the Star Tribune are more along the lines of 8 inches. 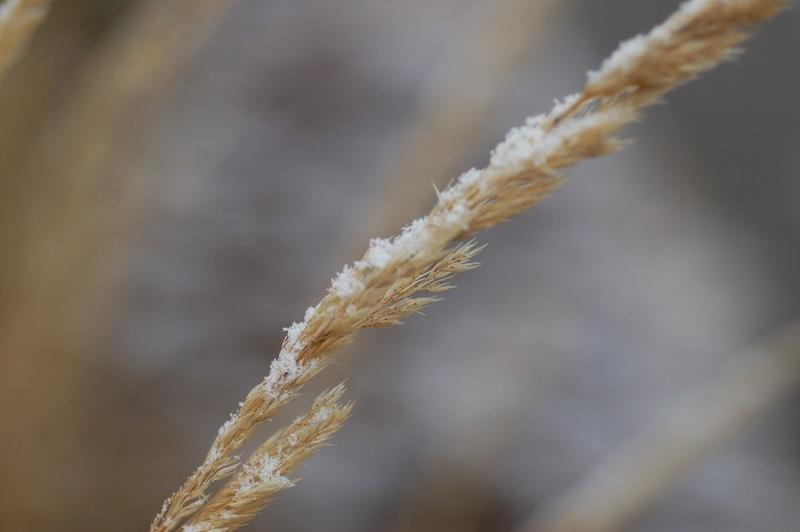 A dusting of snow fell on ornamental grass in St. Paul on Friday. Updated forecasts in blue font reflect forecasts as of late afternoon/early evening on Saturday. In general, there appeared to be a late afternoon trend toward somewhat higher snow totals and greater confidence in the storm. We're about 24 hours away from the expected onset of the largest snowstorm to hit the Twin Cities in what seems like a long time. The highest snow forecast we found for the central MSP metro was for Fox/KMSP of 7 inches. The lowest was The Weather Channel with 3 inches. The most common forecast seemed to be 4-5 inches. Here are the latest forecasts that we captured late this Friday evening. KMSP: 6-8 inches (10 p.m. news). Call it 7. 4.1 with snow meter. MPR: 3-5 @MSP airport (as of 10:27 p.m. blog post). Call it 4. 3-7 as 4:10 update/5:40 tweet suggests 5-10" for metro. Accuweather: 3-6 inches. Call it 4.5. 3-6 as of 5:40 p.m.
Novak Weather: 6 inches (based on graphic). Call it 6. Solid 6 per afternoon graphic. Note that we've made the call that the amount for the airport will be in the middle of the snow range forecast, a reasonable deduction given that the airport essentially represents the central core of the metro. Roll the dice and let the games begin. Follow us on Twitter and like us on Facebook to get more timely updates. Winter Weather on the Horizon (Redux)? Forecasters in Minneapolis/St. 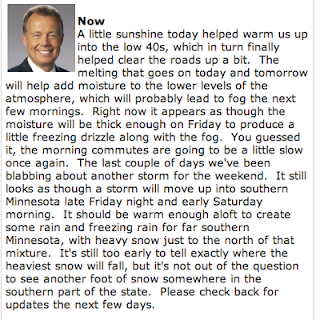 Paul began to talk in cautious tones about a snow-making system for next Sunday/Monday. This no doubt is enough to pump the adrenaline of snow lovers or those who simply want some winter weather excitement. And so, we shall watch the progress.